Sheffield United boss Nigel Adkins has denied suggestions that Jay McEveley has been hampered by being captain. Adkins made the 30-year-old defender his skipper after he took over in June. 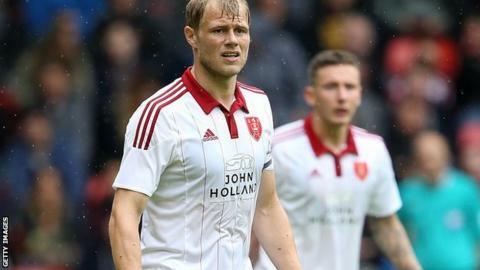 Former Scotland international McEveley has been criticised by some sections of the Blades support after the 3-1 home defeat by Bury on Saturday. But Adkins said: "I don't think he's been affected by it. I made him captain because he's been exemplary in training and around the club,"
The former Southampton and Reading boss told BBC Radio Sheffield: "At every club there is someone who gets highlighted and maybe just now that's Jay. "I look after the players as much as I can and I'm very protective of the players. There are enough people from the opposition trying to make things difficult so we have to make sure we give the players confidence and belief." Saturday's defeat by the Shakers saw the Blades slip to fifth in the table but victory over Colchester on Tuesday would see them move up to third. Adkins acknowledged that he had to take a share of the blame for his side's first home loss of the season. "The first thing I always do is reflect on myself and the tactics I picked and substitutions I made," he added. "You make decisions that you think are right at the time and I brought an extra striker on at 1-1 because I wanted to win the game. "You are allowed to make mistakes as long as they are honest ones."